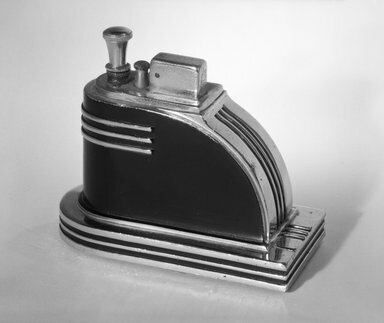 Artist:Louis V. AronsonArt Metal Works, Inc.
"Ronson Touch-Tip" model, streamlined, tugboat shaped tabletop lighter (a) with wick holder (b). Flat chrome-plated base rounded at one end, square at the other end. Incised all around with two parallel bands painted black. Chrome-plated turret-like top rounded on one side. Side elevation of top is quarter round curved down in back to meet base. All the vertical planes of the top are painted black. Three parallel chrome bands curve around the sides of the front extending about 1/3 of the length. On the horizontal plane at very top are a knob (b) attached to a flint that fits into hole and a finger depressor to activate mechanism. CONDITION: Good; with normal wear, numerous scratches on chrome, some pitting on black enamel.